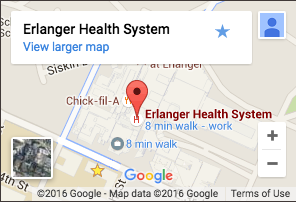 Erlanger East is a full-service, community hospital taking care to the next level with world-class surgical, emergency, heart, stroke, cancer, and pediatrics care. Our $50 million expansion brings striking architecture, unique amenities, and inviting accommodations in a hospital like you’ve never seen before. But importantly, the new East also unveils an equally dynamic expansion of medical services. Long famous for Women’s Health – we’re also now raising the bar for advanced pulmonary, surgical, stroke, heart, cancer and critical care. Discover how a world-class health system builds a comprehensive, community hospital. Erlanger East Hospital and the Erlanger Cancer Institute now offer comprehensive outpatient oncology services under one roof. Our practices include Gastroenterology, Medical Genetics, Neurology, OB/GYN, Oncology, Pediatrics, Family Medicine, and Urology.